In these days of high unemployment and global financial crisis, it’s nice to relax with a bottle of wine that doesn’t break your pocketbook. I’m here to sort out the memorable from the truly awful, and each bottle is under $10. Please note, however, that the prices I quote are what I paid at my local store; your pricing will probably differ. 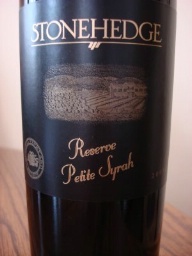 Stonehedge Reserve Petite Syrah, 2007 Special Vineyard Select – Alcohol 14.5% by volume. Cellars located in Arroyo Grande, California. $9.99 at Vons. The label was uninformative, but a couple of wine sites – the Vino File particularly – had the scoop I needed. Surprisingly, the website for Stonehedge didn’t show the Reserve Petite Syrah 2007 at all. My Take: It had a nice juiciness, plus a zing of pepper that I love. If you’re a SWEET red wine drinker, this is not the wine for you. If you like medium-sized reds with a bit of a bite, you would probably like this. Plus, if you give it as a gift, the whole “Reserve” on the label makes it look more expensive than it is – and the taste doesn’t detract from the label. A win-win! My Rating: ~ Drinkable ~ I guess I’m getting picky as I taste. I’ve got a few favorites, and this, sad to say, didn’t make my “I’d buy it again” list. But that doesn’t detract from it’s tastiness! Bear Flag California Smooth Wine Blend Modesto, California Alcohol 12% by volume Blend of Tempranillo, Touriga, Zinfandel and Alicante Bouschet (I know – don’t know a couple of these, either!!!) $6.99 at Vons. On the Label: It’s wild. Check out the website. The label, plus it’s low price, is why I picked it up. Characterized as closer to the “sweet” scale, this is a “sweet” red that I enjoyed. In fact, I was surprised to see they characterized it as such. It was an easy-sipper and went very well with the clean-out-the-veggie-bin soup I made yesterday. Easy. Not a big wine; if I had to put only one varietal to it, I’d put it close to a Merlot. The label is cool, and they have other blends I’m hoping Vons will carry so I can try them out. My Rating: ~ Drinkable ~ Again, it wasn’t a breathless wine – but it’s a solid choice for that rushed evening when you’re really looking to sip something as you make those burgers. Or chicken patties. I will say you won’t regret it! As usual, this is just my honest opinion and will depend upon my mood, the meal I just ate, and what cycle the moon is in. Your taste buds will differ. Demon Soul is available for the Kindle and the Nook! Have you read it yet? This entry was posted in Wine Friday and tagged Alicante Bouschet, Bear Flag, Christine Ashworth, demon soul, Eden Bradley, hamburgers, Italy, Merlot, Petite Syrah, Stonehedge, Tempranillo, Touriga, Vino File, Vons, Wine Friday, writing, Zinfandel. Bookmark the permalink. Debbie, you are such a sweetheart. And I think I’d adore your hubby, too. Thanks for the comment – you made my week!